The 6 Cumbria and North East (CANE) diabetic eye screening services work together to improve services for patients through shared learning, quarterly programme manager networking meetings and a local failsafe officer forum. Service improvements have included an increase in screening uptake to a combined average of 84% in the 6 programmes of South Tees, North Tees, Durham and Darlington, Cumbria, Sunderland and South Tyneside, North of Tyne and Gateshead. The 6 programmes have also started to tackle health inequalities by working with disability groups, universities, travellers and homeless organisations. Simple improvements have had a positive impact for service users, For example, Cumbria has introduced a learning disabilities ‘passport’. This is sent out with the screening appointment. The individual and/or their carer completes and returns this when attending the appointment. The passport documents the pre-screening questions, reducing anxiety and distress for patients during their appointment. Screener extremely patient, polite and considerate of the specific needs of my husband (who has pre-senile dementia). Being a HGV driver, screening is very important to me. Knowing everything is ok is a big relief. All done very quickly, in and out with no unnecessary delays. First class service. Thank you. Highly satisfied from entering the hospital to leaving. This service is brilliant and long may it continue, wouldn’t change anything. 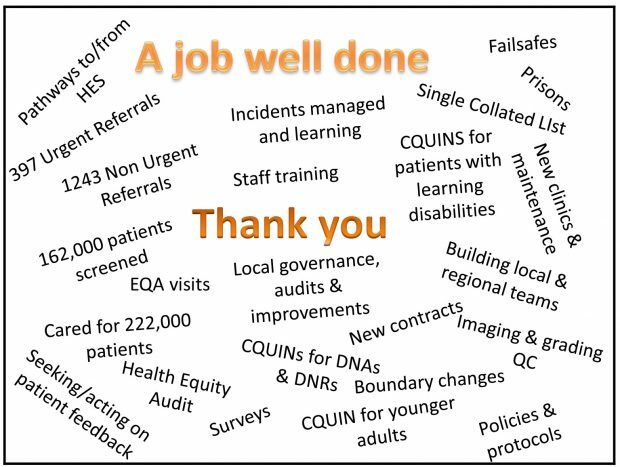 There is still work to do as the local programme managers continue to juggle the various challenges that screening presents. Their next joint piece of work will be to review the status of individuals who are either excluded from or opt out of screening as the new pathway standards are implemented. Other services that would like to know more about these service improvements, such as the learning disabilities ‘passport’, can contact the PHE Screening helpdesk. The PHE Screening BLOG provides up to date news from all NHS Screening programmes. You can register to receive updates direct to your inbox, so there’s no need to keep checking for new blogs. Well done to the 6 CANE Diabetic Eye Screening Services for their fantastic work. We are in the process of developing a questionnaire to assess the experience of our Children and Young People (CYP) who access diabetic eye screening services across London. We would like to hear from anyone who has previously done a similar piece work specifically with CYP or if they are planning to do this in the near future.